With the advent of the new generation of synthetic aperture radar (SAR) satellites, it has become possible to resolve fine-scale features on the sea surface on the scale of meters. The proper identification of sea surface signatures in SAR imagery can be challenging, since some features may be due to atmospheric distortions (gravity waves, squall lines) or anthropogenic influences (slicks), and may not be related to dynamic processes in the upper ocean. In order to improve our understanding of the nature of fine-scale features on the sea surface and their signature in SAR, we have conducted high-resolution numerical simulations combining a three-dimensional non-hydrostatic computational fluid dynamics model with a radar imaging model. The surface velocity field from the hydrodynamic model is used as input to the radar imaging model. The combined approach reproduces the sea surface signatures in SAR of ship wakes, low-density plumes, and internal waves in a stratified environment. The numerical results are consistent with observations reported in a companion paper on in situ measurements during SAR satellite overpasses. Ocean surface and internal waves are also known to produce a measurable signal in the ocean magnetic field. This paper explores the use of computational fluid dynamics to investigate the magnetic signatures of oceanic processes. This potentially provides a link between SAR signatures of transient ocean dynamics and magnetic field fluctuations in the ocean. We suggest that combining SAR imagery with data from ocean magnetometers may be useful as an additional maritime sensing method. 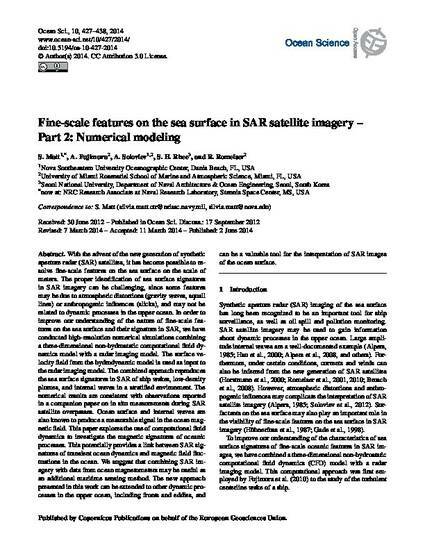 The new approach presented in this work can be extended to other dynamic processes in the upper ocean, including fronts and eddies, and can be a valuable tool for the interpretation of SAR images of the ocean surface.